To promote and, where appropriate, support best management practices as a means of enhancing the ecological health of Te Waihora/Lake Ellesmere and its tributaries. To raise awareness regarding the cultural and historical significance of the Lake and its environs, including the settlement history and current status. To provide appropriate dialogue opportunities for decision-making to ensure the various economic, social, cultural, recreational and environmental interests are considered. To maintain the sense of place and character that makes the Lake and its environs special to current residents and users, and for future generations. To raise awareness and understanding of the values of the Lake to recreational and other users to ensure the integrity of the Lake is not compromised. In attaining the Objects the Trust shall recognise the views and expectations of Mana Whenua, to respect and implement the dual heritage of the partners of Te Tiriti O Waitangi. Currently, the Trust Board has 11 Trustees and meets 4 times each year. The day to day management of the Trust is delegated to Management Committee of 4 Trustees who meet every six weeks. Waihora Ellesmere Trust (WET) is a community organisation dedicated to the improvement of the health and biodiversity of Te Waihora/Lake Ellesmere and its catchment. 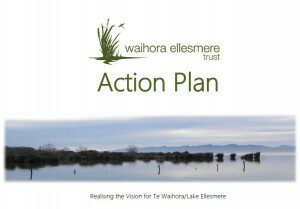 The activities of the Waihora Ellesmere Trust are guided by our Action Plan, a living document, adopted by the Trustees in 2012. This Plan was developed to articulate WET’s role over the next ten years. It was adopted by the Trust in September 2012 and has been reviewed in 2015. Read the Action Plan here. Each year we think about what activities and projects we might pursue for the coming year and how these link to the Action Plan. This is, in effect, our Annual Plan. The update for 2018-19 can be read here. Each year we report on our activities in our Annual Report – see below for the reports from the last few years. Waihora Ellesmere Trust was established in 2003 to implement a Community Strategy, developed over two years of community deliberation and consultation. The Trust Deed was first signed in 2003. In 2013 some minor amendments were made and the current Trust Deed is available here. The Community Strategy, developed by an issues working group made up of representatives from a wide range of sectors, guides the work of the Trust. The Strategy identifies goals, targets and actions to achieve a Vision for the Lake and environs. Many organisations and individuals have worked hard in the intervening years and achieved a great deal. Individual organisations have reported on what they have been doing but a recent report from WET, 2003 – 2010 An Update, brings that information together. The report includes a section on what has been achieved (Part 1) and also how WET has contributed – effectively a brief history of WET (Part 2). If you have any additional information to contribute, please let us know. 2017/18 – you can read our annual report here and see a brief slide show of the main points here. 2016/17 – you can read our annual report here and see a brief slide show of the main points here. 2015/16 – you can read our annual report here and see a brief slide show of the main points here. 2014/15 – you can read our annual report here and see a brief slideshow of the main points here. 2013/14 – you can read our annual report here and see a brief slideshow of the main points here. 2012/13 – you can read our annual report here and see a brief slideshow of the main points here. 2011/12 – you can see a slideshow of WET’s annual report here and a brief overview of the Trust and its activities (2011/12) here.